Other than writing under various pseudonyms, I also do a bit of ghostwriting. 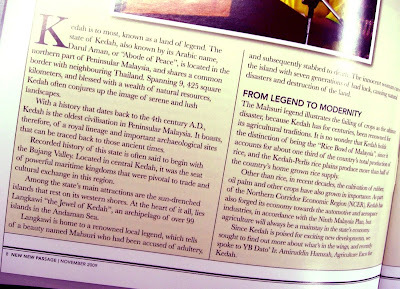 Recently, the editor of New Passage magazine, a limited-circulation publication for the state of Kedah, sent me a copy of their November 2009 issue, which contained a contribution by yours truly. 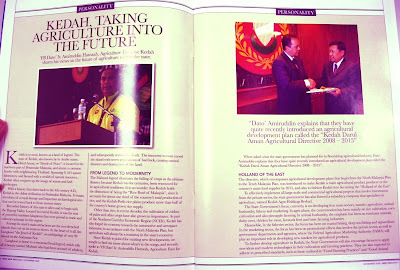 To learn more about investments in Kedah, do check out the Kedah Investment Centre, the publisher of this magazine. My review of Tina Turbin's book, Danny the Dragon Meets Jimmy, was mentioned on her website, the official Danny the Dragon blog, and her other website GlutenFreeHelp.info. Check them out!